The open secret of Indian restaurants in the UK is that most are actually Bangladeshi and, for every decent Indian restaurant, there are tens that are serving up poor quality dishes swimming in grease. On top of that, half the dishes are invented for the British market and at times the colour is artificially boosted. Of course there are some simply superb Indian restaurants, a number with Michelin stars; Gymkhana is currently the flavour of the month with celebs. But many of the top Indian restaurants are doing a fusion of Western fine cooking and Indian spicing, rather than fine curries. 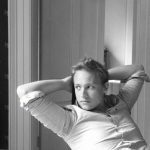 As good as they undoubtedly are, it does pose a problem when you want a traditional curry of the quality and style you would find in the best restaurants in India. Darbaar is a welcome exception and saviour of this problematic situation. Founded in 2015 by Chef Abdul Yaseen, one of the original founders of the then pioneering Cinnamon Club, he serves up Royal Indian Cuisine. That’s to say he serves up dishes inspired by the banquets of the Indian Royal Court in the modern glass and wood décor of the City based restaurant. As then, the best way to enjoy the delights on offer is as a feast for the whole table to dig into. 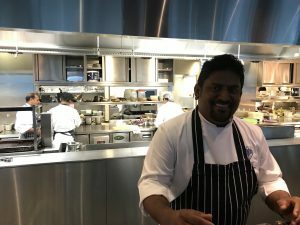 Chef Abdul’s passion for his native cuisine is clear and infectious, to the point that, from time to time, he will invite diners to pop up to the bar that separates the open kitchen and the dining room. The science behind Indian cuisine is simple but many are scared of it so he aims to ‘demystify’ it for diners, allowing them to understand how the flavours work and even try cooking it at home. Sometimes he will give lessons on making your own spice blend at home rather than using the pre made stuff that can be highly questionable. On my visit, he went into the science of two basic marinades – the red marinade and the white marinade. I won’t go into all the detail but it was intriguing and there are a few simple rules to remember for any marinade you do. Of course simplicity is key as we all have a tendency when using spices to over complicate matters. The first thing to do is squeeze fresh lemon juice over the meat – in this case chicken – as this opens up the pours. Then stir the meat round with your hands and, when it starts to discolour, add salt as this is when the meat can absorb it and season internally. It’s also best to use chopped ingredients and the stalks of herbs like coriander; it stops them drying out when being cooked and allows for a continued and developing flavour to be released. Finally, when it comes to chilli, use fresh chopped chilies as opposed to chili powder which is best used just for colour (bright red chili powder is made from just the chili skins; the darker chili powder is made using the whole chili including seeds). The food at Darbaar shows off Chef Abdul’s skills superbly. Simply put, it was the best Indian of this style that I’ve had outside of India and better than many of the ones I’ve had there over the years I’ve visited. Vibrant and bright, the paneer was moist and beautifully flavoured by the mild marinade, and set off perfectly by the coriander, dates and fig chutney. 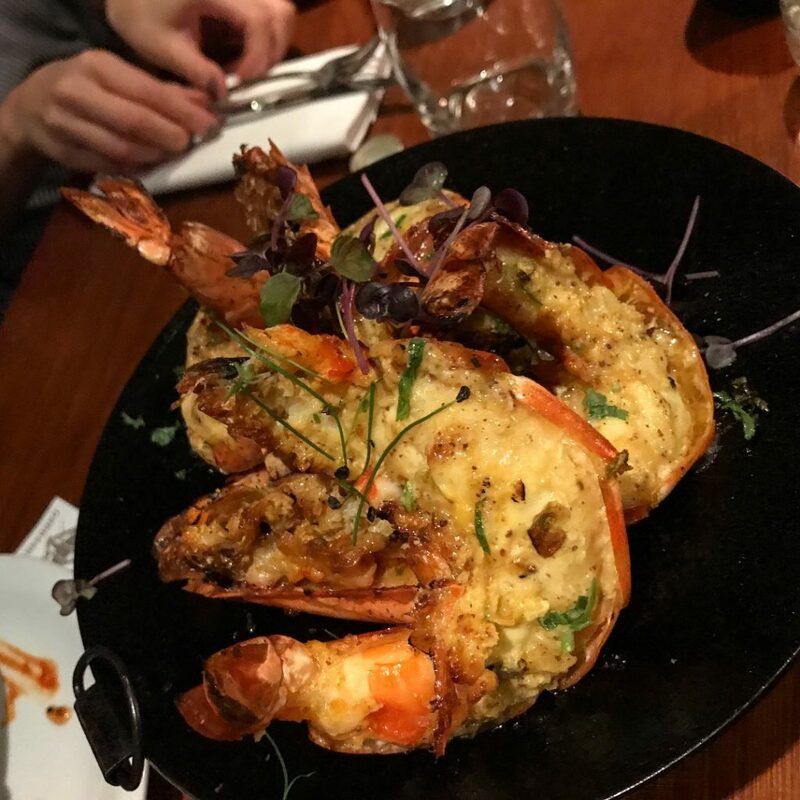 The large succulent and juicy Royal Bengal style wild Madagascan prawns were grilled and packed with flavour from the four-day marinade. The double smoked chicken with basil, with a beetroot yoghurt, was quite the surprise, basil not being a common ingredient in Indian cuisine. 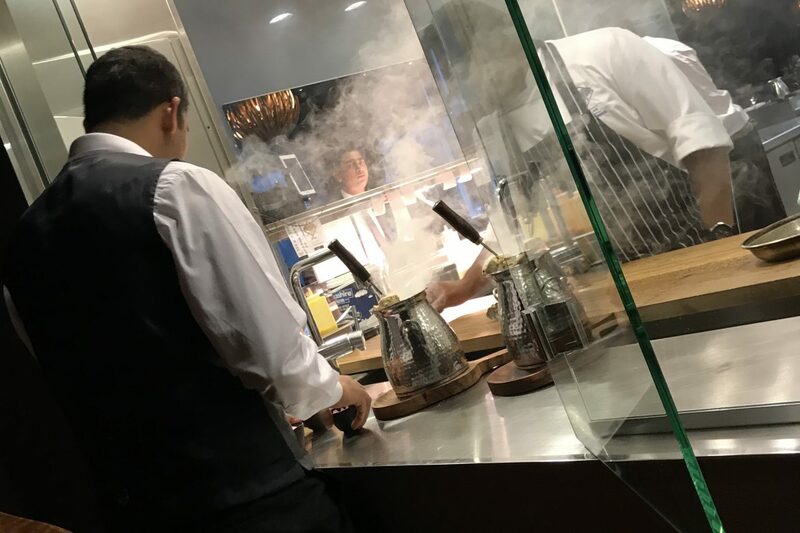 Served on skewers in smoking pots, it’s quite a spectacle and carried on the trend of not being dry – something that can often happen when chefs of lesser skill cook using a grill or tandoor. The main was a veritable feast of twice cooked leg of lamb, daal, butter chicken, naan, cucumber and mint raita, and pilau rice. 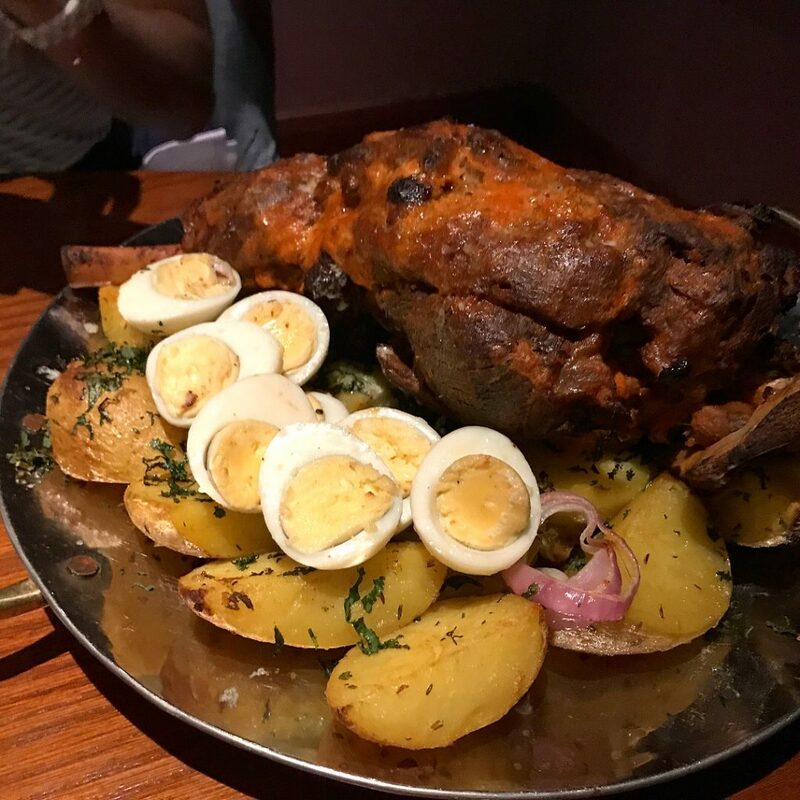 Fit for the Mughal emperors of old, the lamb was served on the bone surrounded by potatoes and hard-boiled egg halves. While only there for show (if I recall from my time in India they are meant to represent jewels, though don’t hold me to it), the egg worked perfectly with the lamb, helping to offset the slight sweetness. The daal was unctuous in its creaminess and spice and the pilau faultless. The star for me, though, was the butter chicken, by far and away the best I have ever had. If you don’t fancy a full-on feast, try heading for lunch. After all, what could be a better way to liven up a boring or stressful day in the City, than a stunningly spiced Indian meal. 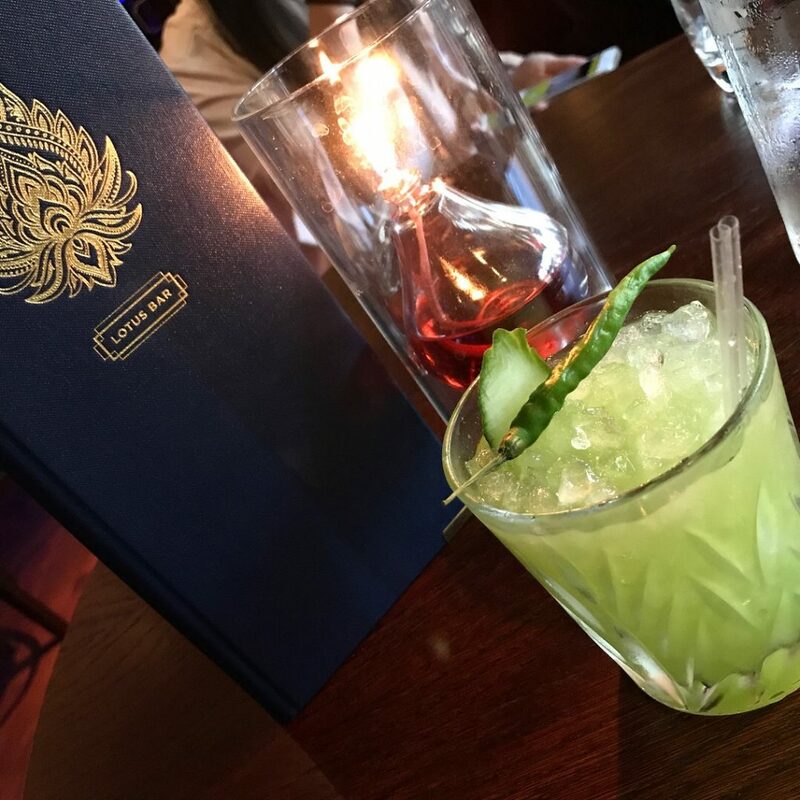 Darbaar’s bar, the Lotus Bar, is also well worth visiting and having as a venue for post work drinks (before an impromptu curry perhaps); they serve, besides the usual drinks, spiced cocktails, including a green chilli take on the Tom Collins and a twist on the Margarita. The bar snacks are also peerless for their kind. 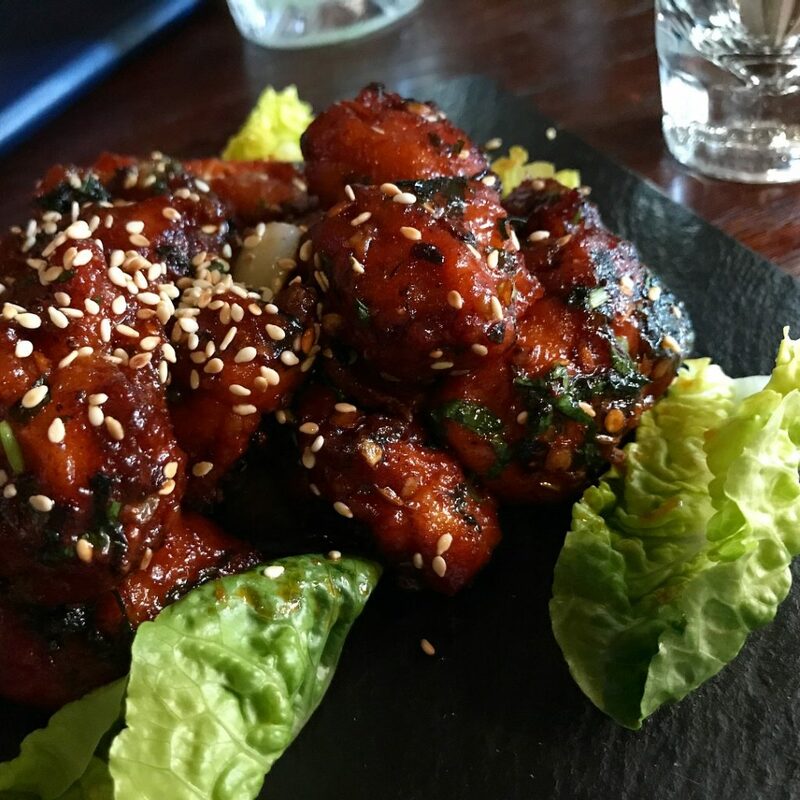 Stir-fried cauliflower with honey and chili glaze, salmon in dill dressing, and Indo style chili chicken were all perfect examples of their kind that surpassed similar versions I’ve had elsewhere. Darbaar really is worth a visit. No matter what you try, it will wet your appetite for more and repeat visits. Better still, it is one of the few places of quality that cooks this style of Indian cuisine and that cooking is done by a chef whose passion can be detected in every mouthful. Prev postThe Tomato and Kiwifruit Layer Cheesecake – A 1980s Food Crime?